“The UM 900 is individually styled and innovative. A modern classic in design. A modern classic in sound. 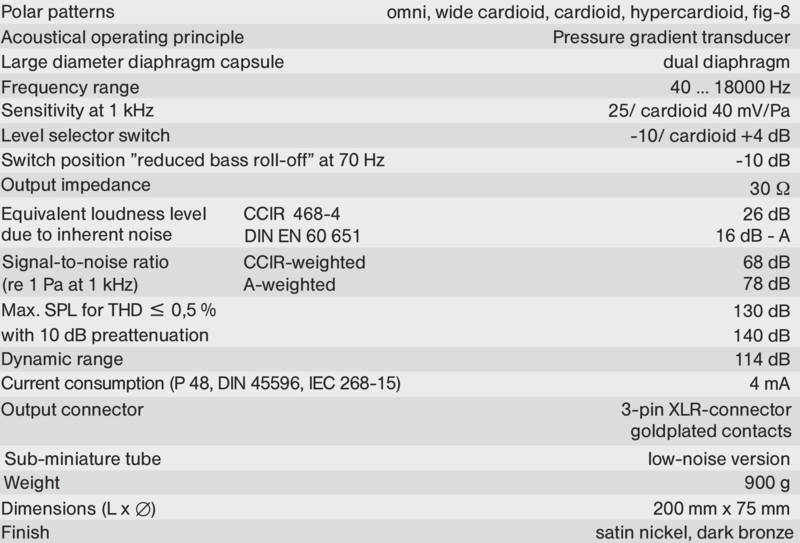 The UM 900 is a low-noise large diaphragm valve (vacuum tube) microphone featuring the renownedGeorg Neumann M7 capsule with sputtered gold PVC membrane. Uniquely, it draws its power direct from a 48V phantom power supply source such as a console input. The UM 900 has five polar patterns selected by a switch on the body. The warmth, detail and smoothness owe much to the modern low noise valve circuitry, but the combination of the acoustically optimised shape of the body, combined with the classic handmade M7 capsule results in a studio microphone that satisfies the demands of modern recording whilst displaying all the best characteristics of a vintage valve mic. 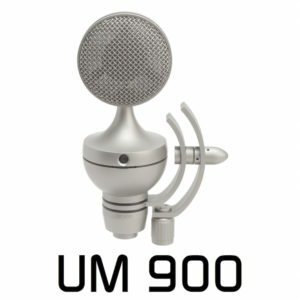 The UM 900 is the first switchable pattern, valve condenser microphone which can be connected to industry standard 48 volt phantom powering using a normal 3-pin XLR microphone cable. This is made possible by an advanced circuit design for the amplifier and internal power supply. The pickup capsule uses a traditional, proven design with two large, gold plated PVC membranes. Three switches are located around the body of the UM 900. 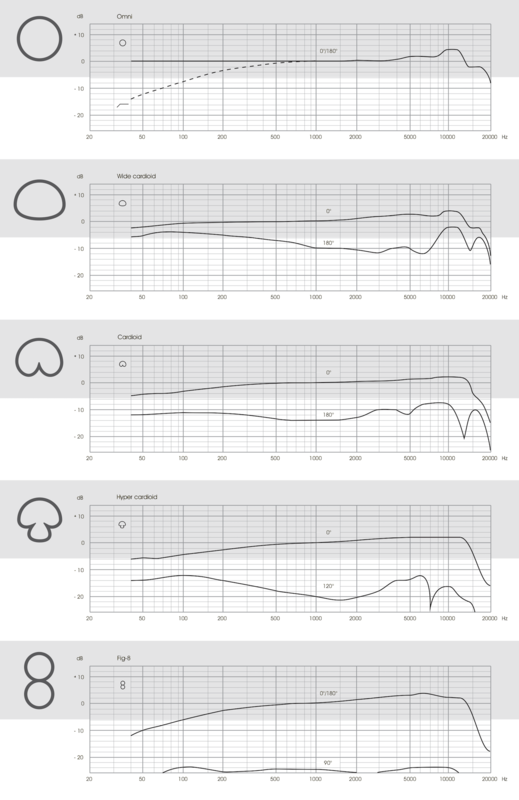 The switch in the front selects the polar pattern: omni, wide cardioid, cardioid, hyper-cardioid and figure 8. Located 120 degrees to each side are switches for gain adjustment and low frequency roll-off. The unusual shape of the microphone’s body is especially designed to minimise undesirable reflections of sound toward the pickup element. Acoustic influences which could result from the housing resonance and/or mechanical vibration are reduced by the robust construction and by a special fixture within the microphone’s housing which dampens vibration. The high sensitivity and low noise of the UM 900 make it especially suitable for vocal and speech pickup in professional sound recording studios, scoring stages and broadcast studios. 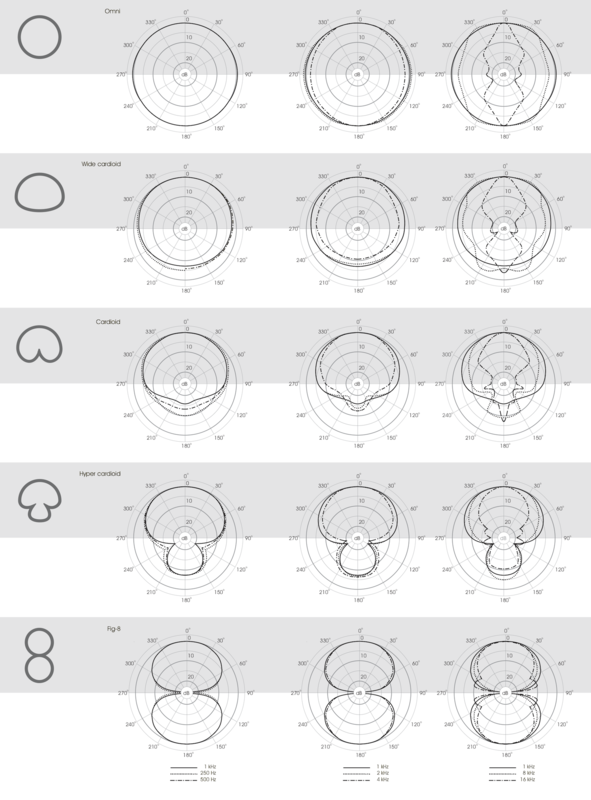 The 5 pickup patterns allow the microphone to be tailored to a wide variety of applications. For example, the microphone can be used as an overall pickup for a large orchestra or it can be used as a solo or spot mike for individual instruments. It may also serve as an announcer microphone where its proximity effect may be desirable. The pick-up capsule is mounted in a large, acoustically open headgrill which prevents mechanical vibration interference. This gives the microphone a clean, colourless sound characteristic. The internal valve (vacuum tube) amplifier of the UM 900 can be powered by any external 48 volt phantom supply which can provide at least 4 mA of current. The amplifier uses a specially selected valve (vacuum tube). An internal DC/DC converter provides all the necessary voltages. amplifier and balanced output transformer. THIS links to a Vimeo video, recorded in February 2015, showing the UM 900 as a vocal mic. for a female singer.